Thembalethu bridge is a hotspot for criminals. 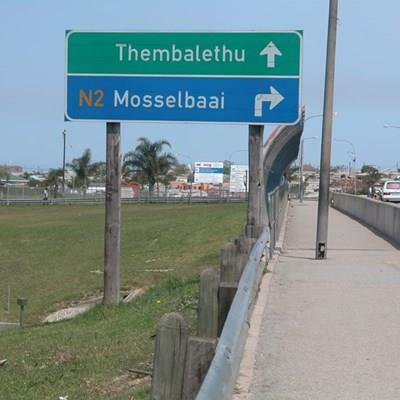 GEORGE NEWS - Residents of Thembalethu and surrounding areas have raised a red flag about the dangers of Thembalethu bridge, saying the bridge has become too dangerous for people as robbers patrol the area looking for easy targets. One such target was Siyabulela Nkata (37), who was stabbed and beaten to a pulp by robbers and was robbed of his possessions. He said it is a miracle that he survived. "Last year when I was coming from Port Elizabeth I was dropped off at the bridge and I met a number of men who attacked me and robbed me of my belongings. The place is dangerous and something needs to be done to protect people in that area," said Nkata. Another victim, Siphamandla Sinxo (21), was recently robbed and stabbed. He said he was coming from work at about 17:00 when a number of men approached him and wanted to take his wallet. When he resisted, they stabbed him in the back and on the arm. He had to be rushed to the George Hospital for medical treatment. Nimzamo Booyseen also wrote on Facebook saying her friend's son was robbed at the Thembalethu bridge. These incidents sparked a debate on Facebook about the safety of pedestrians at the Thembalethu bridge. Readers wanted to know whether the CCTV cameras installed at the bridge are in good working condition and if the footage obtained from these cameras can be used as evidence in court. It appears that the people don't have much faith in the effectiveness of these cameras. Residents also asked for greater visibility of municipal law enforcement in the area. Incidents of robbery and assault at the Thembalethu bridge are increasing and people are becoming fearful to cross it, even in broad daylight. Addressing these concerns, municipal manager Trevor Botha said the CCTV cameras that are installed on the N2 are all in good working order. They are monitored and the police are notified of criminal offences. "The footage can most definitely be used as evidence in a court of law, and some of the offences have in the past been successfully prosecuted with the help of the CCTV cameras," said Botha. He said, however, that visible policing is a function of the police, not municipal law enforcement. "The latter is responsible for the implementation of by-laws." Residents are warned to be careful in that area and report all incidents to their police station.